After a flash of red, the green is rolling out in our sanctuaries - the Pentecost season is here. And this past Sunday I was preaching on the Holy Spirit, the "down payment of our inheritance" as the redeemed people of God (Eph 1:14). The Spirit has been on my mind lately. 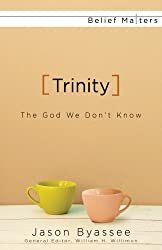 Meanwhile I've been reading Jason Byassee's little book, Trinity: The God We Don't Know, and I'm in the middle of chapter 2: "The Spirit We Don't Know." Byassee's discussing Jesus' incredible promise in John 14 that "the one who believes in me will also do the works that I do and, in fact, will do greater works than these, because I am going to the Father" (14:12). Greater works than these? Greater than turning water to wine (John 2), making the lame walk (John 5), feeding thousands with a few morsels (John 6)? Greater than raising the dead (John 11)? And why does Jesus' exit, his "going to the Father," mean that we will be able to accomplish these greater things? It must have to do with that insistence in John 16 that "it is to your advantage that I go away, for if I do not go, the Helper will not come to you; but if I go, I will send him to you" (16:7). The Helper. The Holy Spirit. While Jesus has to leave his disciples, this Helper will be with you forever (14:16), so do not let your hearts be troubled or afraid (14:27). The Helper Jesus is sending to us will bring peace and teach us everything - through the Spirit, those who believe in Jesus will accomplish amazing things. Greater things, Jesus said. And even the Spirit, the source of these "greater things" from God, even the Spirit with us now is only a down payment: a comforter, the giver of new life (Rom 7:6), an engagement ring, ahead of the day when God wipes away every tear, makes all things new, and God's people come to Jesus like a bride adorned for her husband (Rev 21:1-5). A down payment. Just the beginning. There have been some interesting and important developments over the last few days at General Conference. Let me fill you in. First: the United Methodist Church's General Conference - the denomination's sole decision-making body, which gathers every 4 years, made up of delegates from around the globe - is meeting in Portland right now. As always, one of the most prominent and contentious topics up for discussion at the conference has been sexuality: presently the UMC holds that "the practice of homosexuality is incompatible with Christian teaching," though many United Methodists (especially in the US) are opposed to the church's position. The discord over sexuality has been so intense in recent years that many have feared a looming split in the denomination. This week the General Conference took an unprecedented step in trying to address this conflict: the conference (a body of clergy and lay delegates) requested guidance from the church's Council of Bishops. The bishops have no official influence over the decisions of the General Conference: their roles are generally limited to preaching in worship services at the conference and presiding over the business of the conference in accordance with Robert's Rules of Order. They don't have input in the discussions on the conference floor and don't have a vote on any proposals. As I understand it, the General Conference has never officially requested the guidance of the bishops, but this issue has been so divisive and hope for unity moving forward so scant, that the conference is looking for wisdom and leadership. The bishops' response came in the form of a statement, which you can read online here. Essentially, the bishops recommended that all proposals related to the question of sexuality be tabled, that a special commission be formed to "develop a complete examination and possible revision of every paragraph in our Book of Discipline regarding human sexuality", and that a special session of the General Conference will be called before the regularly scheduled General Conference of 2020, solely to address this issue. On Wednesday the General Conference approved the bishops' plan by a vote of 428-405. "Revising" the church's teachings and policies in The Book of Discipline could mean a number of things. According to the Council of Bishops, "We continue to hear from many people on the debate over sexuality that our current Discipline contains language which is contradictory, unnecessarily hurtful, and inadequate for the variety of local, regional and global contexts." To rectify this, the commission could recommend anything from rewriting and making more sensitive passages that have become painful to many after years of hearing them bandied about inconsiderately (like the famous "incompatible with Christian teaching" phrase), to a radical reversal of the church's stance (which seems unlikely); from a tightening of current rules concerning clergy that often go unenforced, to a restructuring on a denominational level to allow for diverging positions and practices, all under the sanction of the one, global church (for instance, see the "Love Alike Plan" that was proposed this year). Time will tell. Whatever the recommended revisions eventually do look like, the aim is to avoid a schism. For now, this proposal (defer the conversation - commission - called General Conference before 2020) is the church's best shot at finding a way to accommodate the variety of deeply-held convictions on the question while maintaining the unity within the church body that Jesus himself desired and prayed for (see John 17). And that's what's been happening at General Conference. "Will the conference affect Portlanders?" "Will the conference affect Portlanders?" she asked. Tomorrow, May 10th, the United Methodist Church's General Conference will begin in Portland, Oregon. Every four years bishops and delegates from around the world gather somewhere for General Conference and make decisions affecting the mission, the money, the principles, and the organization of the UMC. I was just reading an article from The Oregonian explaining all of this to the locals, and the articles ends by briefly addressing the question: "Will the conference affect Portlanders?" While I am glad to hear it reported that some people may be blessed by Portland's United Methodist guests over the next week and a half, even that happy observation only reinforces another, rather depressing take-away. Will the conference affect Portlanders? Yes. While they're here (mostly inconveniencing us). But that's all you need to worry about. Beyond the immediate effects on traffic and hotel room availability, etc., once they're done and gone: No, the conference will not affect Portlanders. The mission of the United Methodist Church is to make disciples of Jesus Christ for the transformation of the world. But apparently Portland hasn't heard that we're transforming the world. Which makes me wonder: have the people in your town heard? Or in mine? Or do they just know that you don't want to turn left onto the highway right here on Sunday mornings, because the church traffic makes it tricky, and that you need to get to the restaurant pretty early to beat the after-church crowd? Will the conference affect Portland? Will it affect Oregon? Will it affect Georgia or Michigan, Natchez, D.C., Manila, Mutare, or Baton Rouge? Will the work of United Methodists affect the world? Will your congregation? Has anyone seen the world-transforming, disciple-making power of your church? They just know we have meetings, argue over different things, and occasionally some people may benefit from our presence. So what do we need to be doing, what does your congregation need to be doing right where you are - how can we love the Lord and love our neighbors in a way that the world will hear about? How can we start to take people from assuming the conference will not affect them to never forgetting how those United Methodists affected their lives for good? United Methodists everywhere have two critical tasks this week (and I'd invite Christians of all stripes to join in both). One is to pray for the deliberations and decisions of the General Conference, that the Holy Spirit would stir in hearts and direct the church. Two is to go and touch someone's life in the name of Jesus Christ. In other words, to go and make disciples of Jesus Christ for the transformation of the world. I don't have a great track record with this sort of book, but here we are in May, and I'm still going strong! That's because MacDonald (a huge influence on C. S. Lewis) is overflowing with unique perspectives, powerful insights, wonderful images, and just plain interesting interpretations of the scriptures. And because I've been struck so often and so profoundly by things I've read there over the last few months, I thought I might begin to share some of his words here on the blog. I wanted to start with a simple little passage that nevertheless seemed to jump off the page, sit down, and stare at me from an uncomfortably close distance. Later on (April 25th), he warns us about opening "your windows to the mosquitoes of care," whose buzzing drowns out the voice of the Eternal in our lives. That thing you can't stop worrying about, is there something you need to do about it at this very moment? No? Then quit making excuses, offering rationalizations. "Cast your cares on the Lord, and he will sustain you" (Ps 55:22). "Give all your worries and cares to God, for he cares about you" (1 Pet 5:7). Give your worries to God, quit holding on to them, because they're really holding on to you. They're the cares of the world that choke the gospel out of our lives (Matt 13:22); they're draining the spring of your life. They're distracting you in this moment - while you're looking at this screen, or just waiting for you to finish reading - they're distracting you from trusting in the living God. And that's what life is really all about.